On this 2.5 hour walking tour, you will discover the fantastic part of Shinjuku, the biggest ward of Tokyo. Enjoying the neon lights, local atmosphere and modern skyscrapers in Shinjuku at night, you will be taken exploring from west Shinjuku to the east. You will have a chance to get the amazing views, experience the local Japanese 'Izakaya' pub-style food in Omoide-Yokocho and watch Godzilla Head in Kabukicho. 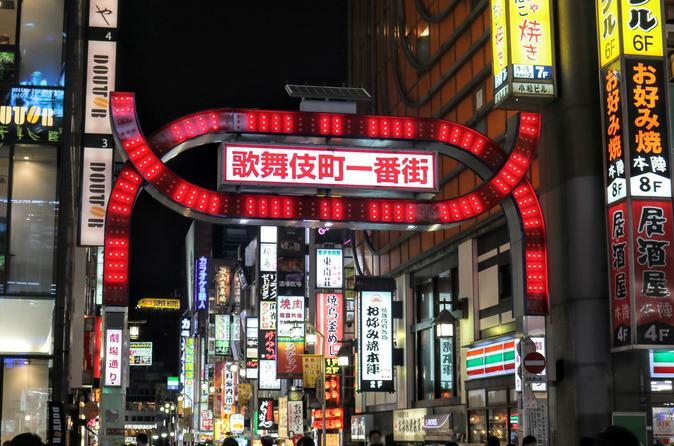 You will then head to the Golden-Gai which is atmospheric nightlife district in Kabukicho. The final stop will be visiting the Hanazono Shinto Shrine, one of the most historical shrines in Japan. This tour will depart from the west exit of the JR Shinjuku Station at 18: 30 pm (2018). Uniqlo Shinjuku Nichigushi(West) Shop at 18: 30 pm (2019). Your English-speaking tour guide will join the tour. The first stop is the Omoide-Yokocho, which is also called memory lane. There are many kinds of Japanese-style restaurants here. You will be provided a light meal here for about 45 minutes, with Japanese-style meal such as Edamame and Yakitori including one drink. You can experience the local atmosphere here. Then you will walk to eastern parts of Shinjuku, heading to Kabukicho. You can see the Godzilla head at the top of the Toho Cinema and your guide will show you the famous photo opportunities so you need not worry about missing anything. Later, you will pass through the Shinjuku Golden-Gai for 20 minutes, and your tour guide will also give you the brief introduction of Kabukicho during the tour. The last stop will be the Hanazono Shinto Shrine for about 15 minutes where you can explore the history of Shinjuku. You can experience how the Japanese worship here. The tour will be finished around 9 pm.